For those of you without Latin numeracy, L = 50. A friend of mine turns 50 today. He went to art school. 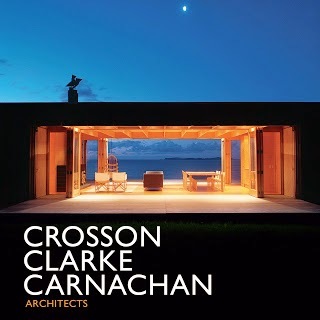 Crosson Clarke Carnachan was launched last Wednesday at Bath Street Gallery in Auckland. There has been coverage of it here and here, but neither article credits the book’s designer, Diana Curtis, who really should have got top billing over the editor (me). We started work on it in April 2008, expecting to publish in 2009, but you know how architects are with deadlines. It is published by the NZ Architectural Publications Trust as part of a series of architectural monographs. Diana designed and I edited earlier volumes on Pete Bossley, Jasmax and a few others. They are quite good. Have I mentioned that my next book will be launched on Monday at Te Papa by the deputy Prime Minister before an expected audience of 200? The Wintec Press Club meets for lunch three times a year in Hamilton: guests are the students of the Wintec journalism course, important media types from the Waikato and Auckland, politicians and famous sporty types. And me. The host is Steve Braunias, Editor in Residence on the course. This time the guest speaker was Pam Corkery. The Duncan Garner edition from May is here. When Rachel Glucina was the guest speaker in August I was laid low by flu, so roped in Joshua Drummond to report. This time I was up for it. I could face Pam Corkery. Met her years ago at a mutual friend’s funeral and liked her. On the other hand, there had recently been the Internet Mana party, which was mad. At my table were Sarah Daniell, editor of Your Weekend; David Seymour, ACT MP for Epsom, and David Bennett, National MP for Hamilton East, both of them proper MPs, none of your list rubbish; Jonathan MacKenzie editor of the Waikato Times; and two Wintec journalism students, Erin Majurey and Rich Garratt, both of whom were terrific company and were serious about journalism. Hah. They’ll learn. In his introductory speech Steve Braunias gave a good and well-deserved kicking to the idea that there was a long-ago golden age of New Zealand journalism: in his view the golden age is arguably now, in part because the recent crops of Wintec students have been so good. He also made several sales pitches for his new self-published book Madmen: inside the weirdest election campaign ever, which was on sale at the back of the room (“$20, Eftpos available, cash also”). It’s a nice object: small format; brilliant cover image courtesy of Joshua Drummond; and only 116 pages. So I bought a copy and one of these days I’ll get around to reading it. Just before she was due on stage Corkery disappeared with Sarah Daniell for a crafty fag. I knew this: Braunias didn’t. A kinder person than me would have told him. He launched into his introduction but had to stop when he realised that Pam had left the building. He improvised – brilliantly, I have to say – for about 10 minutes until she deigned to take the stage. He said of her that she was “a legend, a marvel and I dig the way her mind works”. Corkery instantly launched into a 40-minute whinge about how beastly the media had been to her during the recent election campaign, when she was press secretary or something for Internet Party leader Laila Harre. This seemed a bit rich coming from someone who is both a former journalist and a former MP, so knows exactly how this game is played. She didn’t make a lot of sense and had nothing constructive to offer by way of advice to the students. But she was very entertaining. She gave a very good impression of Russell Brown, “85 years old”, and delivered the line “Russell Brown, man of the people” as witheringly as anything said by Maggie Smith in Downton Abbey. 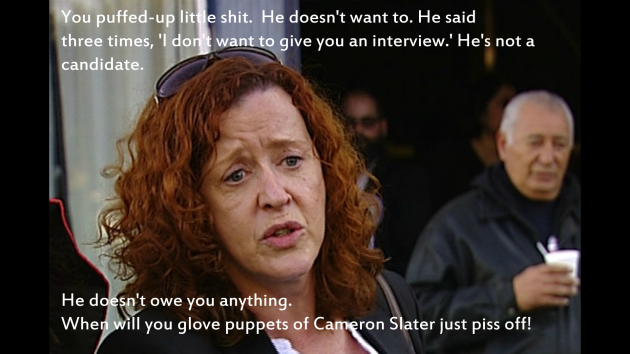 At one point David Seymour gamely heckled: she responded with vigour. At question time David Slack got Corkery talking about alcoholism. During her lengthy reply Braunias, at her side, ostentatiously drank a Heineken then interrupted: “Pam raises an interesting point when she refers to wallpaper.” I hadn’t noticed that she had referred to wallpaper because I had stopped listening, but Braunias went on to extol the virtues of the Ferrybank’s new wallpaper before thanking Corkery. It was a masterclass in how to close down a speaker who has begun to bore. Earlier, in between plugs for his new book, Madmen: inside the weirdest election campaign ever (“$20, Eftpos available, cash also”), Braunias announced the winners of the annual Wintec Press Club awards. Because this is a blog of record, here they are. The Wintec Press Club best friend award went to David Slack, who apparently says nice things about the club on the radio. Finally, Best Sentence of the Year by a Wintec journalism student: “A good sentence is a joy forever,” said Braunias, “a moment when language achieves a momentary state of grace. And the $500 cash prize means it qualifies, in a dollar per word ratio, as the richest literary prize in New Zealand and perhaps the world.” Which is probably true. Alone in the dark I left my body. It was a directionless exit. More of an expansion in all directions. Perhaps influenced by having just read a copy of the Bhagavad Gita (forced upon me by a young Hare Krishna in downtown Hamilton), I recognised an immense, blue-skinned being which materialised before me as some hybrid Hindu deity, a kind of Shiva/Krishna mashup. As in the story of Krishna, the deity opened its mouth and revealed the contents as the entire universe. . . I was halfway through my second experience in a floatation tank and I was thoroughly impressed. Yes. For once I agree with Braunias: this may well be a golden age of journalism. Certainly, whenever I see Aimie Cronin’s or Matt Bowen’s byline in the Waikato Times I read the story, whatever its subject. One of the pleasures of the Wintec Press Club is catching up with old and new friends from journalism. This time there were Diana Wichtel, Donna Chisholm, Bruce Ansley, Karyn Scherer. . . As I left the last meeting of the Wintec Press Club for 2014, I spied across the room the familiar figure of Steve Braunias’s mentor Jumbo Trudgeon, veteran parliamentary hack, who plays such a poignant role in the penultimate chapter, pp 101-109, of Madmen: inside the weirdest election campaign ever (“$20, Eftpos available, cash also”). The old black guy sitting down with a baby on his lap is Furry Lewis (best known now as the subject of the Joni Mitchell song). Carl Radle on bass, Kathi McDonald (white) and Claudia Lennear (black) on backing vocals, Jim Horn on sax and Emily on – well, if that’s not twerking avant la lettre I don’t know what is. Claudia Lennear featured in the Joe Cocker tour movie Mad Dogs and Englishmen and the more recent one about backing singers, 20 Feet from Stardom. Here she is again from the same show. That’s why you’ll often see a famous author immediately reach for a glass of wine when a member of the public approaches. So here are the Band with “It Makes No Difference”. That’s Rick Danko singing the lines “Cause just like the gambler says, read ’em and weep.” Also, “Stampeding cattle, they rattle the walls.” I hope these are not metaphors for our industry. 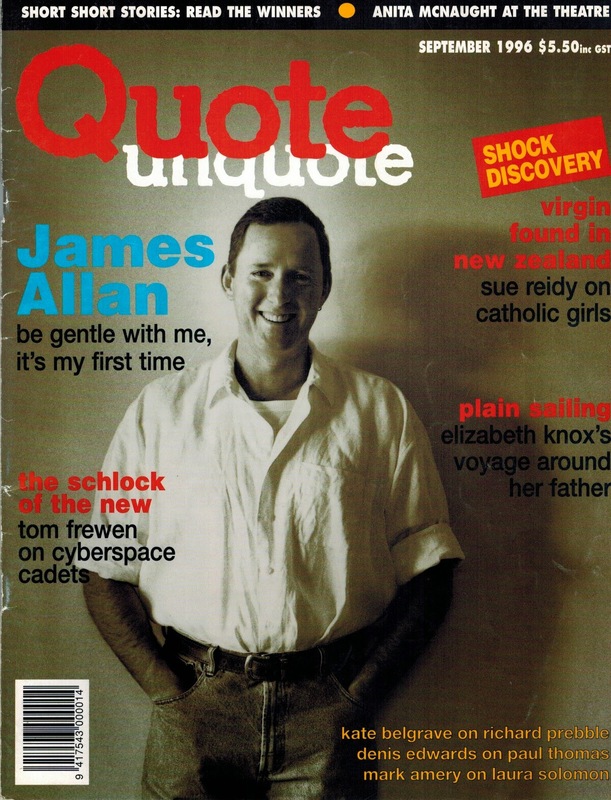 The 75th in this occasional series of reprints from Quote Unquote the magazine is from the September 1996 issue and is by James Macky, the artist formerly known as James Allan. It is about his experience as a first-time author with Growing Up Gay. James was the first out gay journalist in New Zealand, and is one of the bravest people I know. He is also one of the wittiest. Cover portrait by John McDermott. Sensitive new-author guy James Allan tells how the response to his first book has made him a nicer, more caring person – but a more competitive one. Having spent the past 13 years churning out a wide variety of feature stories, travel pieces, gossip columns, restaurant, book and movie reviews for Metro, the Listener, Fashion Quarterly and other magazines too numerous to mention – including the fine literary organ you’re holding in your hands – I was taken completely by surprise at the professional and emotional upheaval that accompanied the publication by Godwit Press of my first book, Growing Up Gay, in January. As anyone in the print media will tell you, it’s rare for a writer to get any feedback from the public. Appear on television for five seconds and you’ll be recognised in coffee bars for the rest of your life. Write a newspaper column every day for a decade and, at the end of it, you’ll be able to drop into your local Cheers and discover that nobody knows your name. Sadly, when the piece appears, it fails to elicit the slightest response. The awful truth is that people who stuff letters into bottles and then cast them onto the high seas are more likely to have their words acknowledged than are print journalists. But, as I happily discovered, book authors are treated entirely differently. No longer just one of many names on a crowded masthead, a book author stands alone and recognisable. People who read your book are eager to share their censure and praise, however faint and damning, with you, The Author. But authors don’t just depend upon the kindness of strangers for feedback. I was absolutely astonished, when my book was published, to receive congratulatory cards, letters and phone calls from old friends and relations who’d never been moved to compliment me on anything I’d written previously. For a writer more used to the completion of his work being rewarded by an editor’s grudging, “I guess it’ll have to do,” all this attention can be overwhelming. I became practically unhinged at the launch party Godwit threw to celebrate my book. It was a marvellous egotistical occasion when I, the writer, held centre stage. At all the magazine parties I’ve been to, it’s always the publisher, the editor, the advertisers and the marketing manager who get all the attention. Writers are way down at the bottom of the pecking order, alongside the layout artists, the receptionist and the cleaners. Having launched the book, the next big hurdle for every author is reading the reviews. Having complained for years about never getting professional or private feedback, one realises the sharp truth behind Truman Capote’s prickly comment, which he erroneously attributed to St Therese, “More tears are shed over answered prayers than unanswered ones.” I can imagine no more demoralising a moment than one spent reading or listening to a critic skilfully sketch your lack of talent, skill and intelligence. Is it helpful, I wonder, to have someone go on national radio and point out your many errors of grammar, spelling, fact and taste? Fortunately for me, I was not slowly turned until crisp on a literary rotisserie. My book received wonderful reviews in the New Zealand Herald, Evening Post, Metro, North & South, Listener, Sunday Star-Times and Daily Telegraph. Only the Waikato Times, in what was still a very decent review, was less than gushing. The Times’ slightly negative response brought home to me another hitherto unnoticed authorial trait: the great protective love we feel for our work and the unhappiness that strikes every fibre of our very being when our book is less than adored. In general I’ve found journalists to be less proprietorial about their writing. Becoming aware of the relationship between authors and their books not only made me, a fellow author, a more sensitive and caring person, but it also brought about another “first” in my freelance career – I actually turned down a paying job! A glamorous and pleasurable one to boot. I was thrilled when Heather Church, Kim Hill’s producer, asked me to review Peter Hawes’ latest book, Leaping With Unicorns. Then I read it. I returned the book, explaining that I didn’t think I should review it because I didn’t enjoy Hawes’ work. Its humour didn’t tickle my funnybone, and I was irritated rather than charmed by his constant word play. In the end, integrity and sympathy intact, I told Kim and her listeners that, although I wasn’t too keen on Leapfrog, I was sure there were certain readers who would simply love it. Being a sensitive new-age new-author type of guy, however, hasn’t lessened the competitive streak that comes with publication. Suddenly, it’s not enough to be published. You also want to sell more copies than Barbara Taylor Bradford and Jeffrey Archer combined. My biggest thrill was going into the Auckland Public Library, looking my file up on their computer, and discovering that the Auckland libraries bought 16 copies of Growing Up Gay. I now constantly check up on other local authors to see if the library buys as many copies of their latest. If I’ve outsold them (a rare event) I’m ecstatic for the next few days. The only sad note in this whole happy affair is that Growing Up Gay has yet to appear on any bestseller list. The question everyone asks you, once your book is out, is “How well are you selling?” You have no idea. The publishers send you a statement every six or 12 months telling you the number of copies sold. I’d been told that trying to get any information about sales between statements is pretty difficult. Peta Mathias, the ravishing Titian-haired author of Fete Accompli, told me she’d go into her publishers and try strangling them to see if she could squeeze out any information, to no avail. My only consolation on the bestseller front was the recent publication of Stevan Eldred-Grigg’s The Rich, a book which seemed to be largely made up of quotes from other writers. Ollie Newland, the former high-flying property magnate, strongly upbraided Eldred-Grigg in his Herald review for having taken everyone else’s words – and not their best ones, either – and tossing them together for his own purposes. In The Rich, Eldred-Grigg quotes extensively from several Metro writers, including me. He never asked permission, or even told us in advance, that he was using our work to flesh out his book. “Pretty shabby behaviour, not to ask us first,” said one Metro colleague. Initially I thought little of the fact that Eldred-Grigg hadn’t contacted me before using my words in his book. However, after receiving a very polite letter from Bronwen Nicholson, publisher at Addison Wesley Longman, asking for permission for use an extract of my work in a new textbook and offering to pay for it, brought home to me how impolite Eldred-Grigg had been. Still, looking on the bright side, “All’s well that end’s well.” I have the consolation that The Rich leapt straight into the bestseller list, so I feel that I at least made it, if only by proxy. There is a small corner of the bestseller list that is forever mine. Yesterday afternoon I took Miss Ten and Miss Twelve to Te Awamutu to see Stacy Gregg who was doing a book signing. They are big fans of her pony novels. Stacy inscribed her latest novel, The Island of Lost Horses, “To [Miss Ten], whose dad gave me my start as a professional writer!” Which is true – it was in 1988 or 89, when I was deputy editor at Metro and commissioned pieces from her most months. (She talks briefly about those early days in this very good Viva interview last month, with kind words about me and James Allan, and very good advice for aspiring journalists/writers.) Stacy would have become successful anyway – it was blindingly obvious she would, because talent and work ethic – but it is very satisfying to have my children discover for themselves and become admirers of a writer I like a lot and helped a bit early on. Just before we left, Stacy explained to the daughters that the way to persuade me to buy them a pony each is for them to ask me several times a day, every day. The drive back from Te Awamutu takes 20 minutes. Guess what we talked about. Thanks, Stacy. Another bumper crop, two letters from the 11 November issue. As always, spelling, grammar, punctuation and logic are exactly as published. I particularly like “flotsam and jettison”, and as always wonder what the unabridged letters were like. Gregor Ashby’s letter of November 8 has appeared appropriately in the edition that could also give an idea as to why Hamilton is now a ‘ghost town’! Do many Hamilton city dwellers really appreciate living, and doing business under the dominant logo depicting ‘scum’, filth, and defilement, as does the title and image of ‘Riff-Raff' – as imposed upon them by those of twisted, rebellious hearts and minds? These people, who like impudent, spoilt brats, appear to be given their heart’s desire in savouring whatever abased area of human depravity can be legally accepted and allowed under the freedom of newly enacted legislation that stands proudly, in perversion, against the righteous ways of many generations past! Are we ashamed and offended under this banner of darkness, that is fluttering over our community? – We should be! So it came to pass that an era of progressive leadership took control of the city and embarked on a plan of development and enhancement designed to encourage business growth, appease landlords and leave behind a memorable legacy of fame guaranteed to deliver civic acclaim, streets and parks named in their memory, even the possibilities of knighthoods and such like symbols of national gratitude. As these new brooms, all flying on noticeably enlarged right wings contemporaneously made plans and enacted activities to ban the great unwashed from the city’s new enhancements, and garner further revenue by retiring any possibility of liability for the city’s ageing population. And so a new utopian era is born. Gone forever are those of low economic value, whether unemployed or too aged or infirm to contribute to the new order of full employment, suddenly gone! zapped into non-existence! Other cities and towns will hopefully pick up the unwanted dregs, the flotsam and jettison, meanwhile Hamilton. . . a young city, a clean city, a city without real heart or social conscious forges ahead, cold, clinical, in credit. A car travelling along Watkins Rd had an egg thrown at it, damaging the paint work. At about 10pm, there was an assault near the intersection of Duke and Victoria Streets. Police would like to hear from the victim who was assaulted in the incident. As yet, they have not come forward. A young boy was reported to have been bitten by a dog while at Cambridge skate park. Anyone with any information is urged to contact Waipa District Council’s dog control officer. Overnight, four letterboxes on Moore St and one on Christy Brown Pl were stolen. Police are asking anyone who hears any letterboxes being stolen to contact them through the 111 system so the offenders can be held responsible. A car struck a power pole on Kaipaki Rd. The driver, who was disqualified from driving at the time of the accident, was intoxicated and a blood test was taken. A home at Lauriston Park retirement village was burgled. A heat-pump unit and a microwave were taken. At least this week no compost was stolen. Meanwhile 45 per cent of the ladies in Cambridge think guitar players are irresistible as they’re ‘good with their hands’. Such good news because I live in Cambridge and can play the guitar. I am so heading out to the pub tonight, if my wife will let me. Britons voted All Along the Watchtower as Hendrix’s most popular hit. The tune was also listed as number 3 of all time to serenade a loved one, while Oasis’ Wonderwall came first and Led Zeppelin’s Stairway to Heaven came second. Odd that Neil Young’s “Down by the River”, the first song I ever played in public (with Brent Parlane at the Tauranga Folk Club), never rates in these polls of how to serenade a loved one. All together now: “Down by the river, I shot my baby… Shot her dead.”. This was on Young’s 1969 album Everybody Knows This is Nowhere, so quite a while before Nick Cave’s Murder Ballads. I didn’t head out to the pub. Police are investigating reports of a burglary at St Kilda Cambridge subdivision over the weekend. As the Cambridge Edition went to print, early indications were that nothing had been stolen. A car was found after a crash on SH1. A car was broken into in Discombe Rd. A laptop was stolen. An incident was reported to police where teenagers had removed shopping trolleys from The Warehouse and filled them with bags of compost. They dumped the trolleys in a garden and left. Police attended a domestic incident in Wordsworth St.
Three men were found walking through Cambridge Park subdivision and taken home by police. Police attended two domestic incidents in Cambridge. A theft was reported by staff at Lochiel Golf Club. A laser distance measurer was stolen from the Pro Shop. Police attended a car crash on King St.
Four saddle blankets were reported stolen from the Equidays event held at Mystery Creek. Police attended a domestic incident in Luck at Last Road. There was a disorder incident outside Freshchoice in Leamington. A man was reported to have thrown and smashed a bottle, but he left the scene before police arrived and was not found. Police attended a domestic incident. An 18-year-old Cambridge teenager was caught drink driving with a reading of 52lmcg. A Cambridge teenager was caught drink driving with a reading of 554mcg. A 50-year-old Cambridge man was caught drink driving. He chose to have a blood test.